With all of the controversy surrounding the implementation of these new taxes, Britain would try to make concessions with the colonists by repealing the hated Stamp Act. This may have seemed like a victory to the colonists, but the British would simply replace this with laws that were seen to be worse by the colonists. The Declaratory Act (1766) would officially declare the right of the British to govern the colonies in any way they saw fit. This was a legal step that they took to try to make any decision they wanted to in the next few years, and colonists realized this quickly. Once the Declaratory Act was established, the British moved to pass more taxes on the importation of a handful of things in the Townshend Acts (1767). The colonists became enraged by this, since the British had acted like they were changing the policy and then pushed more repressive laws soon after, and many businessmen would attempt to smuggle their products around the British to circumvent these laws. The most hated of these new taxes from the Townshend Acts would be the tax on tea. Like most British subjects of the time period, the American colonists drank tea daily, so this tax was one that was immediately felt by most of the American colonies. 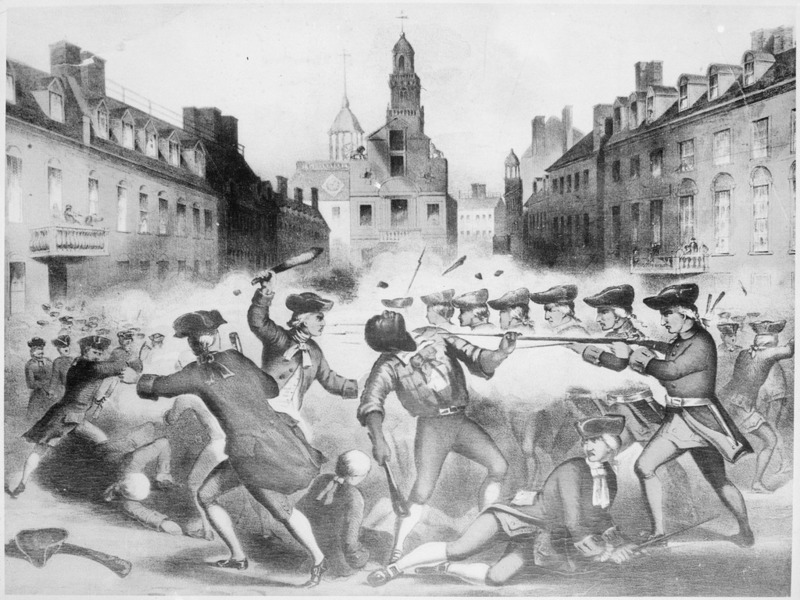 the British sent 4,000 troops to the the port city of Boston, to try to attempt to pacify the city instead of allowing anti-British violence to start. This act had the opposite effect than the British intended because the Bostonian population of 20,000 people felt that sending 4,000 troops was significantly oppressive. The worst part of this, to the colonists, was the fact that the Bostonians themselves were forced to house and feed these soldiers in their own home (as part of the Quartering Act). These issues would leave Boston in a state of intense hatred of the troops, which obviously made things quite contentious in the city in the coming years. Two years after the arrival of these troops, a group of Bostonians started throwing snowballs at British soldiers who were on guard. Unfortunately some of these snowballs ended up having rocks in them, whether planned or not, and this would intensify the situation with the guards to the point that they pointed their rifles at the small group of men. During this standoff someone fired a gun and the sound would cause the soldiers to open fire on the crowd in fear. To this day no one is sure who fired the shot, but it led to the death of 5 Americans in the crowd. The most well known of the dead was a young African-American man who was a runaway slave named Crispus Attucks. The bullet he was killed by actually passed through another person before hitting him, but he would be the first to die in the massacre. Many people still consider him to be the first death of the American Revolution because of the importance of this incident, although it would be some time before fighting would actually start. After the massacre was over both sides would try to spin what happened with their own propaganda. The American colonists would call this a massacre for this reason, despite the fact that only 5 people were killed in the shooting. The soldiers were put on trial due to the public outrage over the case and would hire the lawyer John Adams to represent the soldiers. Adams would be criticized severely by other colonists for representing these men, but he believed that they needed a good defense regardless of what had happened. His solid defense would lead to a finding of innocent on 6 of the soldiers while 2 others would get a very small punishment for their role in the massacre. Parliament would realize that the Townshend Acts were making them look bad and would repeal it soon after this, but they kept the tax in place on principle. The fight between Britain and the American colonies would continue to be focused on tea for some time after this, in large part because of the high use of tea in the colonies at the time. The British would start to punish the colonies for their part in these recent activities. Soon after the Tea Party, the British would pass a set of acts nicknamed the Intolerable Acts (Coercive Acts 1774). These acts would close Boston harbor to all ships until someone repaid the amount lost in the Tea Party. The Coercive Acts also suspended many civil liberties and add a new version of the Quartering Act, which had expired in 1770. Other cities sent supplies to Boston to help them through these times, since much of America agreed that British policies were too harsh. Due to these acts, and a variety of others, the American colonists slowly drifted away from the British during this time period. Keep in mind that this was not a quick change, but a slow drift away from their mother country due to laws that people felt were overly harsh.